Although the main focus of this article is about creating loadable families, I’m including Revit’s Conceptual Massing Editor tools to give you an idea of how they work. Their function is different than families created from the Family Editor. 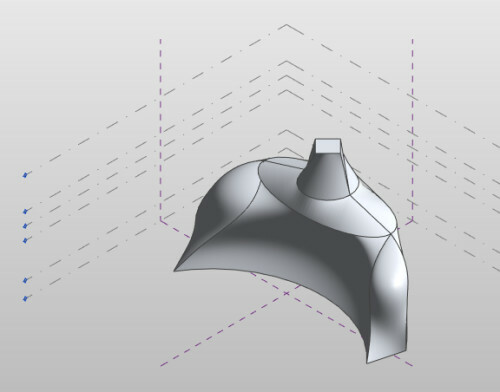 Complex forms can be derived from the massing tools, which, when loaded in a project, can be turned into building components (see Figure 1). Figure 1. Massing components can be loaded in a project and then turned into building components. 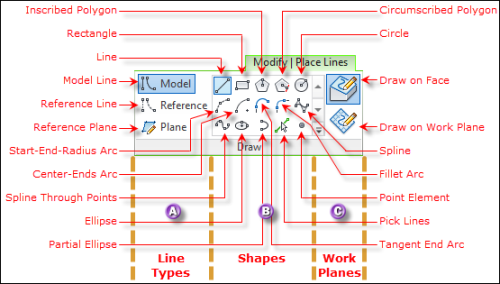 Most users are aware of Revit’s conceptual massing tools. But with my 10 years of working with different companies who use Revit exclusively, I’ve observed that only a handful of users know how to use them. Looking back, I noticed that the designers I’ve worked with prefer using third-party 3D modeling tools to help them visualize their design concepts. Some of my colleagues from other companies also have the same experience. 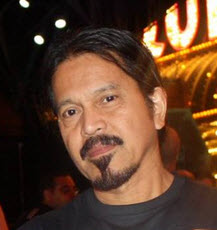 The 3D modeling tools I often hear of are Rhino, formZ and 3ds Max. Why is this? Are Revit’s conceptual massing tools not capable enough? I don’t believe so. I think the answer lies in how easier it is to use other 3D modeling software for visualization and generating organic forms. I might be biased because I’ve used formZ from its inception, but looking at this matter objectively, yes, I believe that other 3D modeling tools do offer better and more intuitive modeling features. But does this mean Revit is not capable? No. 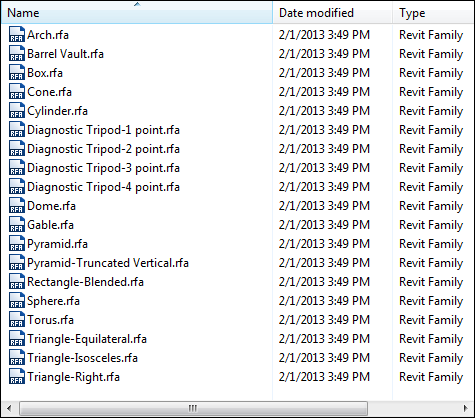 Revit just has a different way of creating conceptual families. Take a look at the Family Editor with its sketch-based/profile methodology. Once you understand the concept, it is really that easy to create families. It’s the same thing with the conceptual massing tools. Just like the Family Editor, massing forms can be created outside the project environment via the Conceptual Massing Editor. They can also be created inside the project by clicking the In-Place Mass button (Massing & Site → Conceptual Mass → In-Place Mass). The mass creation process in both locations is identical. Parameters (e.g., dimensions, visibility, materials, etc.) can also be assigned to mass components. In this article, we will focus on creating loadable mass families. In both methods, the New Conceptual Mass – Select Template File dialog box pops up where you click the Mass template located inside the Conceptual Mass folder. 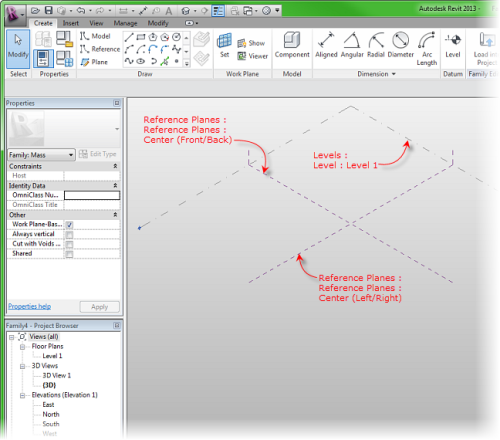 The view defaults to an orthographic Default 3D View showing visible dashed lines that represent reference planes (Front/Back and Left/Right) and a Level 1 work plane (see Figure 2). The ribbon interface looks similar to the Family Editor interface, although there are a few tools specific to massing. Figure 2. Default 3D View of the Conceptual Massing Editor. Figure 3. The tools in the Draw panel. These tools follow the same drawing methodology as the Family Editor’s tools. Massing profiles, however, don’t have to be closed loop as will be shown later. When any sketch tool is selected, the default drawing configuration is Model Line → Sketch Tool → Draw on Face (see Figure 4). Figure 4. Default drawing configuration. The work plane defaults to Level 1. 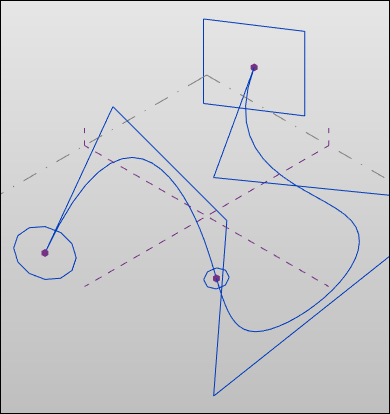 When the cursor is hovered over any dashed lines, their outline appears in blue (see Figure 5). Figure 5. 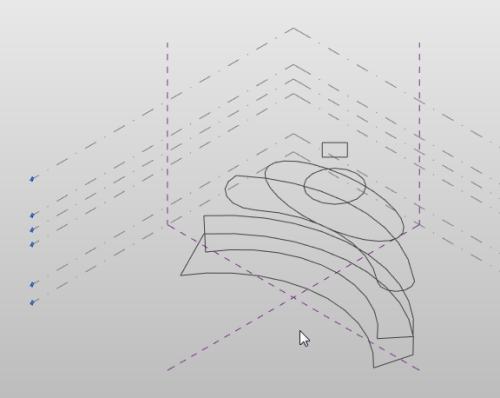 An outline appears when the cursor is hovered over the edge of a work plane. When an outline is clicked, the surface inside appears in light blue and becomes the active work plane (see Figure 6). Figure 6. Clicking a work plane makes it the active work plane. The massing tools are similar to the Family Editor Forms tools in that they have their void counterparts too. *The forms tools are not in the menu. Components derived from profiles are automatically created according to the five mass types mentioned (depending on how profiles are sketched). This is the most basic form that can be created in the mass environment. A profile is sketched first (see Figure 7). Figure 7. A mass extrusion profile. After clicking the Create Form button from the Form panel, the profile is extruded at a default height (see Figure 8). Figure 8. 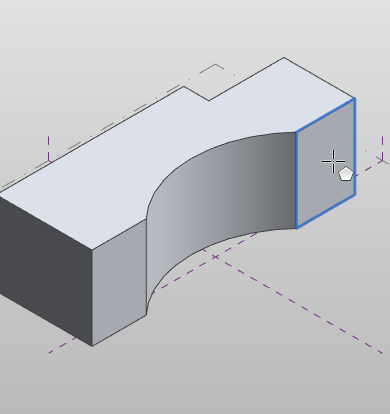 Clicking the Create form after sketching a profile extrudes it at a default height. The cluster of arrows on top can be dragged to change the height. This is called the 3D Control. It is a group of arrows that appear after a profile has been extruded (see Figure 9). They also appear when a surface, edge or vertex is selected. Figure 9. 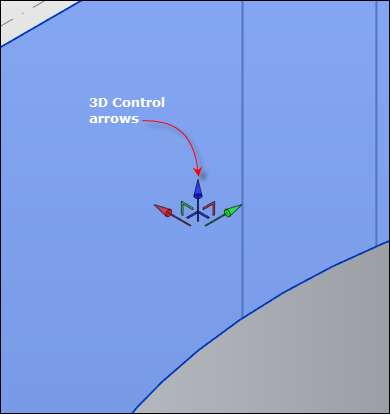 3D Control arrows appear after an extrusion is generated. Note: When a draw tool is hovered over an existing surface, the edges highlight and automatically become a work plane (see Figure 10). 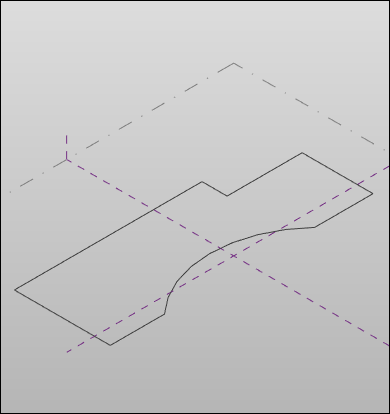 Sketching on an existing surface, however, does not change the previously selected work plane. Figure 10. When a drawing tool is hovered over a surface, the surface highlights and becomes a work plane. 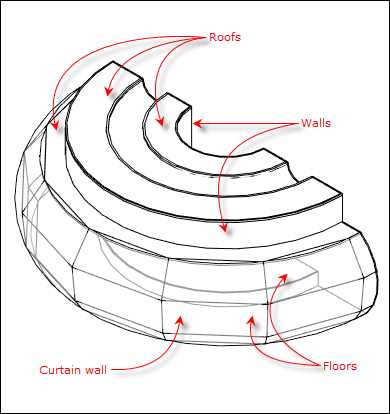 A mass loft form combines profiles sketched at different levels (see Figure 11). Figure 11. Profiles sketched at different levels. After selecting the profiles and clicking the Create Form button, the profiles are combined and the form is generated (see Figure 12). Figure 12. Profiles from different levels can be selected and turned into a loft. 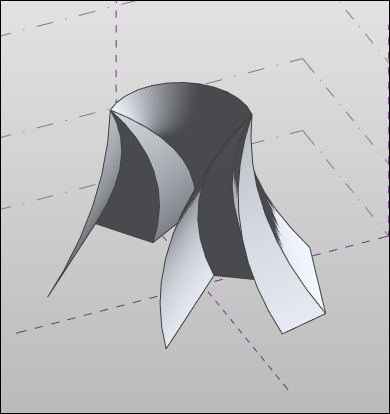 The resulting loft form, like all other form shapes, can be further modified by stretching the 3D control of a selected surface, edge or vertex. When creating the profiles in plan view, a useful function called Overlay can be found in the Properties palette. 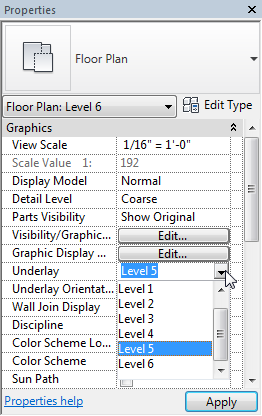 It contains a drop-down list of the levels (see Figure 13). Figure 13. Underlay feature in the Properties palette. This feature enables the lower level to be visible in the current level view, thereby creating a reference for the profile being sketched. Other lower levels can also be made visible by changing the View Range option in the Properties palette. 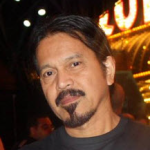 A sweep is a form of extrusion where one or more profiles can be extruded along a path. The process is started by creating a path and placing Point Elements (see Figure 14). 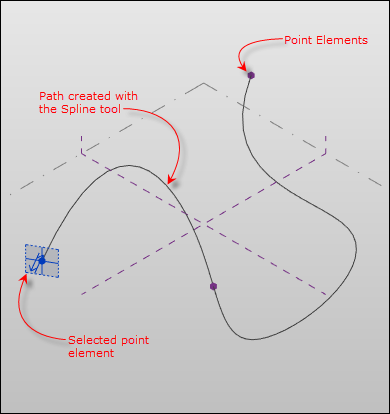 When selected, the point element generates a work plane where a profile, closed loop or open, can be sketched. Figure 14. A sweep path. Next, the path and profiles are selected (see Figure 15). Figure 15. Selected sweep profiles and path. After clicking the Create Form button, the mass sweep is created. This method of creating a mass yields simple to complex organic forms (see Figure 16). Figure 16. A complex sweep. A Revolve form is a mass created by turning a profile around an axis line. The axis can either be a model line or reference line. The profile and the axis must be on the same work plane (see Figure 17). Figure 17. A revolve axis and profile. Note: The profile doesn’t have to be closed where it coincides with the axis line. 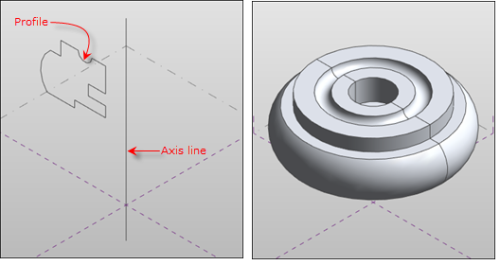 After selecting the profile and the axis line and clicking the Create Form button, a revolve form is created (see Figure 18). Figure 18. A finished revolve form. 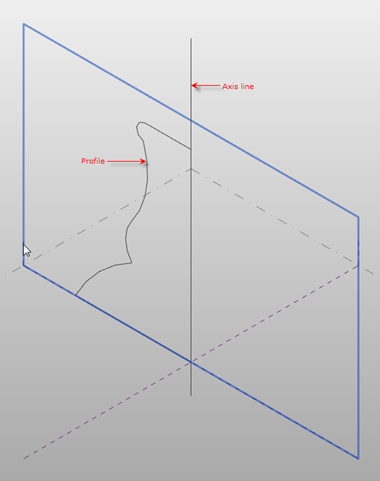 A profile can also be sketched away from the axis (see Figure 19). Figure 19. 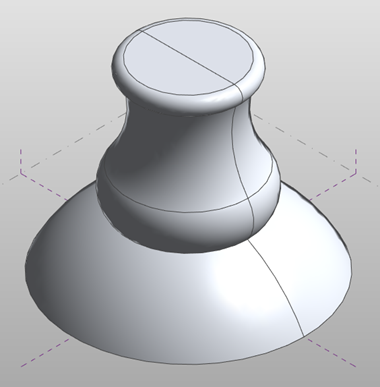 A revolve profile can be created away from the axis line. Start and end angles for the revolution can also be applied from the Constraints option of the Properties palette (see Figure 20). Figure 20. 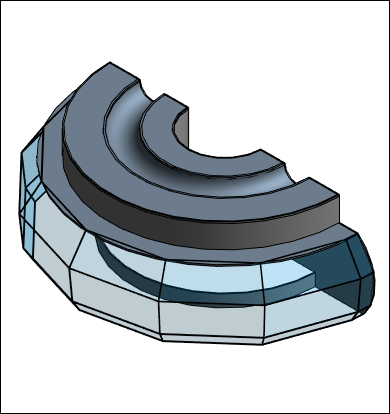 A revolve start and end angle can be specified from the Properties palette, resulting in a pie-shaped form. 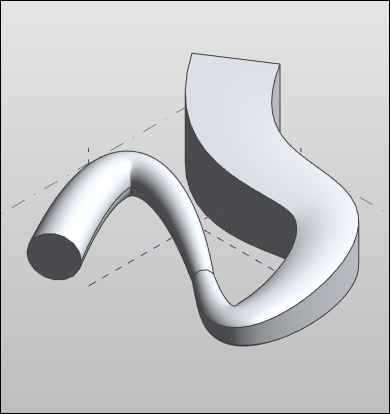 A surface form is used for conceptualizing free-form shapes such as rolling surfaces (e.g., topos) or wave-like shapes. It is a mass form that does not have thickness and is created from an open profile (see Figure 21). Figure 21. 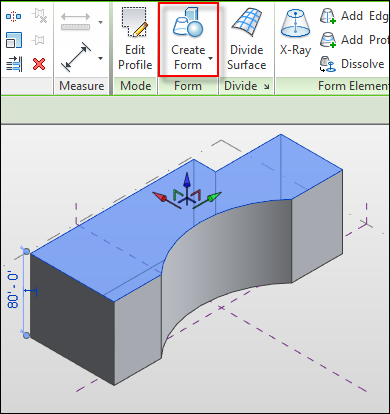 Creating surface forms from open profiles. 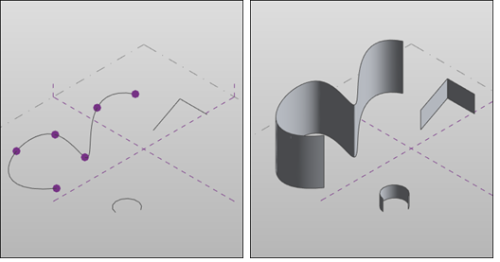 A closed loop profile can be automatically turned into a surface by selecting the check box labeled “Make surface from the closed loops” on the Options bar before sketching (see Figure 22). Figure 22. The “Make surface from closed loops” feature from the Options bar. Surface profiles can be created from different levels or reference planes (see Figure 23). Figure 23. 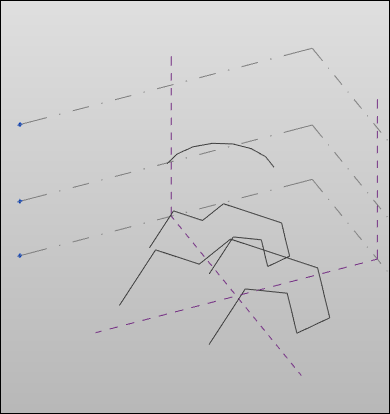 Surface profiles created from different levels. This results in a loft-like complex surface form (see Figure 24). Figure 24. A complex surface created from profiles from different levels. There you go! After writing this article and revisiting the massing tools, I find that generating organic forms from the Conceptual Massing Editor are not that hard to master. Revit’s massing tools are awesome! You just have to get used to the modeling process. The beauty of the forms derived from masses is that they can be loaded in a project and added as components. Be aware, however, that the visibility of masses in all views is turned off by default in the Visibility Graphics Overrides dialog box. But the real power of a massing component is that they can be turned into building components such as walls, floors, roofs and curtain wall systems by using the tools in the Massing & Site tab in the project (see Figure 25). Figure 25. Massing tools in the Massing & Site tab of the project environment. Every surface of the loaded mass can be turned into building components (see Figure 26). Figure 26. Mass components loaded in a project can be turned into building components. After discarding or hiding the mass, the result is a buildable, complex-shaped structure (see Figure 27). Figure 27. A complex building generated from a loaded mass component. Revit comes with massing components if you need a particular form but don’t want to go to the hassle of creating it (see Figure 28). Figure 28. 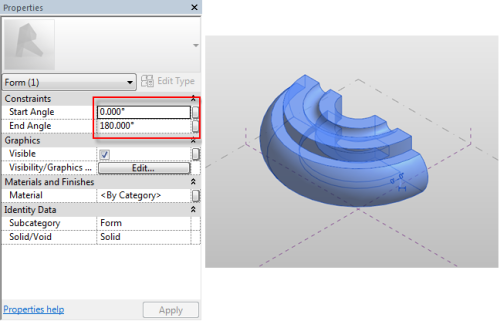 Ready-made mass forms provided by Autodesk. It is up to you to experiment with the Conceptual Massing Editor. Try creating one and then turn them into building components. You might end up dumping your third-party 3D modeling software.